Today: American Protestants, in all their variety, influence, contradictions, and even surprises. 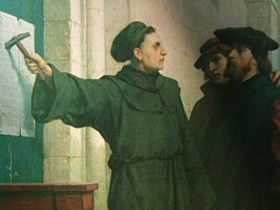 Martin Luther’s protests against the Catholic Church produced the ideas the Pilgrims brought to America: freedom of conscience, the authority of the Bible, salvation only by faith and God’s grace. Martin Marty is emeritus professor of the history of religion at the University of Chicago. Dr. MARTIN MARTY (Emeritus Professor, University of Chicago): The other Protestant idea is equal standing before God. All members. There is no pope or hierarchy closer to God than all members. ABERNETHY: Protestantism’s ideas of self-governance, equality, and freedom became fused with America itself, and religious freedom permitted Protestantism to spread fast. Sociologist Nancy Ammerman, at Hartford Seminary. Dr. NANCY AMMERMAN (Sociologist, Hartford Seminary): When a new group of people comes along and doesn’t exactly fit with the old group that was there, they can go off and start their own congregation. They can start their own denomination. And what we have seen over the course of U.S. history is an incredible proliferation of religious groups, particularly Protestant groups. ABERNETHY: Today, just over half of all Americans are Protestants, worshipping in 300,000 congregations, in many hundreds of denominations — and, often, apart from any denomination. The old Protestant main line used to be the bastion of America’s business and political establishment. The main line lost members until about 10 years ago, when its decline leveled off. Now, our best estimate is that mainline Protestants are nearly 15 percent of all adult Christians. The historically black churches probably have another 10 percent. The big change — and the news, for many people — is that evangelicals are now the largest Protestant group, by far. We estimate the total number of evangelicals, including Pentecostals, at more than a third of all Christians — twice the size of the main line. Southern Baptists are the largest evangelical denomination and the largest of all Protestant denominations, with 16 million members. Very generally, the evangelicals and the black churches are more conservative theologically than the main line, and more contemporary and enthusiastic in styles of worship. Evangelicals emphasize the experience of being born again, and the authority of the Bible. 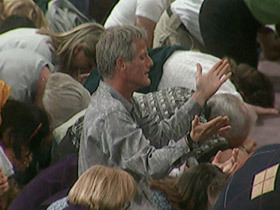 Pentecostals emphasize the power of the Holy Spirit, especially through speaking in tongues. 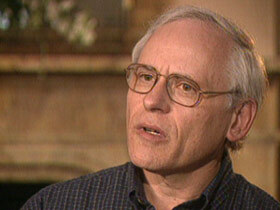 Robert Wuthnow is a sociologist of religion at Princeton University. ABERNETHY: For this series, RELIGION & ETHICS NEWSWEEKLY commissioned a national poll in cooperation withU.S. NEWS & WORLD REPORT. It was conducted a month ago. We asked whether doctrines and beliefs are the most important part of religion, or whether it is individual spiritual experience. Among all Protestants, 25 percent said beliefs, 69 percent said spiritual experience. BOB ABERNETHY: A special report now on the experiences of being a mainline Protestant, an evangelical, and part of the black Church. Kim Lawton has those stories. KIM LAWTON: It’s Sunday morning in Alexandria, Virginia, and at George Washington’s old church, people have gathered for worship. 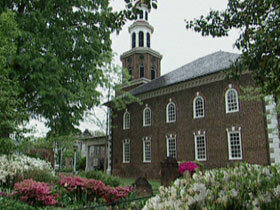 Christ Church was founded in 1773. Over the years, its parishioners included prominent Americans such as Washington and Robert E. Lee. Today, Victor and Amanda Van Beuren are part of the congregation carrying on the tradition of this historic Episcopal church. VICTOR VAN BEUREN: It’s just nice to have that continuity with the past, but it’s really a living congregation. LAWTON: Victor, Amanda, and their three sons have been coming to Christ Church for just about two years, after taking what Amanda calls a long spiritual hiatus. 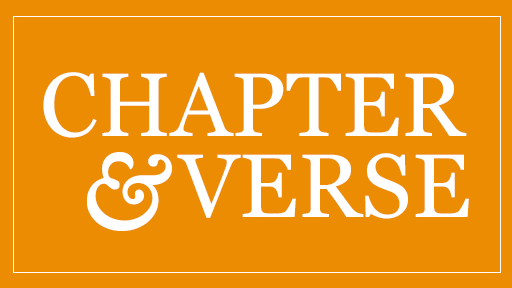 As their kids were reaching school age, they decided to reconnect with church, and they started church shopping in the Episcopal denomination, where Victor grew up. The Van Beurens say they love the traditional Episcopal liturgy, which includes hymns, readings from the Book of Common Prayer, and Holy Communion. For Amanda, who didn’t grow up with a church background, the services often evoke a sense of spiritual awe. AMANDA VAN BEUREN: You might sort of say, well, the pomp and circumstance of the Episcopal service, you know, it’s all pomp and circumstance. But for me, and I think probably for a lot of people, there’s something about that high church that is, it’s a tradition. Maybe it’s the tradition of it, maybe it’s just the beauty of it all. LAWTON: During the service every week, they recite the Nicene Creed, the centuries-old compilation of basic Christian beliefs. Mr. VAN BEUREN: Saying the creed I think is important because it reminds us of the different elements of Christianity. But it can be tough, it can be tough because sometimes you might say, “Oh yeah, no problem, I believe in that.” And some of the other vows you look at and you go, “I don’t know if I think that way today.” So it’s a constant challenge. But it always is a challenge. Ms. VAN BEUREN: I don’t fully understand it, no. The mystery of it all. But I think a lot of life is like that. You know, if, if we understood it all, we’d have no need of community, would we? LAWTON: The entire family has gotten very involved. The kids attend youth program[s] and sing in children’s choirs. Victor oversees the acolytes, the young people who assist in the service. And Amanda can often be found in the kitchen, helping prepare church meals. Every Wednesday night, the family also gets together with a small group of congregation members. They eat together, pray, take communion, and study issues about their faith. Ms. VAN BEUREN: Wednesday nights are really important for me and are really where I get probably most of my spiritual sustenance. And I think it’s because of the intimacy of it. LAWTON: It’s also an opportunity to wrestle with others over some of the complexities of faith. Mr. VAN BEUREN: I can say it’s been easier for me to have a relationship with God than it has to have a relationship with Jesus. Ms. VAN BEUREN: Well, you can’t very well travel on a journey by yourself like that. Mr. VAN BEUREN: I can’t imagine being close to God without being in a community. LAWTON: In Smyrna, Georgia, Sunday worship seems anything but traditional at the Cumberland Community Church, which looks more like a warehouse or a theater than a stereotypical church. Cumberland is a nondenominational congregation. It’s firmly evangelical, theologically conservative — traditional beliefs mixed with a highly nontraditional worship style. That’s just what appeals to Doug and Dani Bentle. 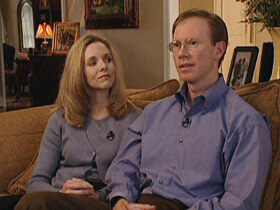 Doug grew up Catholic and Dani, United Methodist. They believe God was leading their own family in a different spiritual path. DOUG BENTLE: To me, it was wanting to get away from tradition — not that there’s anything wrong with that, but I felt like getting away from something that was very traditional would perhaps help me in my walk. LAWTON: The dress here is casual. There are dramas and contemporary music. Mr. BENTLE: Music that was very relevant to today, you know, typical of what we might listen to if we were all just sitting around listening to music, you know, helped us feel comfortable, but also helped us feel like, hey, we could invite other people here. LAWTON: Dani helps lead the music. She finds it a deeply spiritual experience. DANI BENTLE: I really feel close to God when I sing, and when I worship him. And when I sing, this love just wells up. I mean, I can’t even explain how much love that I have for God when I’m singing. 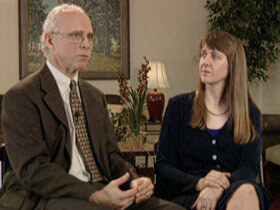 LAWTON: The Bentles are born-again Christians who say they have a personal relationship with Jesus. They believe the Bible offers specific guidance on how to live their lives and how to raise their three kids. Ms. BENTLE: It’s daily things, daily situations where we bring God into it, we bring Christ into it, and what his word says, and that’s how we live. I mean, every day. LAWTON: The Bentles also believe they have a duty to tell others about their beliefs. And they take classes to learn how to do that more effectively. LAWTON (to Mr. Bentle): Do you think Christianity is the only way to salvation? Mr. BENTLE: Yeah, we do. LAWTON: Tonight, Dani is getting ready to head off on a two-week-long missionary trip to Scotland. Members from their church small group have come to offer support and to pray for the missionary team. Dani has prepared a list of her prayer requests. They believe God hears each and every prayer and promises to answer. 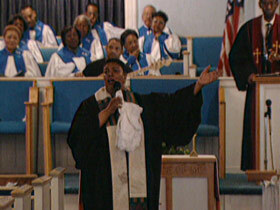 In Indianapolis, members of the Coppin Chapel also believe in a God who answers prayers. 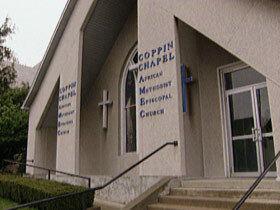 Coppin is part of the historic black denomination, the African Methodist Episcopal or AME Church, which began in the early 1800s. The chapel has been in the neighborhood since 1915, and Eric and Daphne Rolle say the Holy Spirit is still moving here. DAPHNE ROLLE: When the Spirit moves, for me, is when everything seems to be happening exactly as it’s supposed to happen. When everything seems to be in tandem. I mean that’s when I know I’m in His house, and I’m coming there to visit with Him on His turf. LAWTON: Eric, who emigrated to the U.S. from the West Indies in 1989, says they also feel the Spirit move through the preaching of Reverend Brigitte Black. ERIC ROLLE: I always wanted to be in an environment or to worship in a place where the Word is being preached and that the Spirit of God is being felt. Ms. ROLLE: The truth is the truth, you know. And if God is the truth, then when He speaks, He’s speaking as one to everyone. Those are the Sundays when I feel that Reverend Black is talking to me. LAWTON: Like many historic urban black churches, Coppin is struggling to redefine its role in the community. Daphne and Eric and their two kids commute in from the suburbs, but they’re actively involved in helping the church shape new programs for the neighborhood. Ms. ROLLE: At one time, the black church was the heart of the community. And I think that we got away from that. We have to get involved in the communities. The communities are dying. If it’s the church’s mission to spread God’s love and they don’t do it, nobody else is going to. Mr. ROLLE: The drug dealers are there 24/7. So who has a greater presence in the neighborhood? Not the church. LAWTON: They are developing after-school programs. And Eric has become a mentor to young men. Mr. ROLLE: I felt that the Lord placed it upon my heart to mentor, to teach the young men how to be men. The young men need positive male, black male, models. I try my best to be a role model. LAWTON: Daphne and Eric say they are trying to pass on some of the spiritual wisdom and support that they receive from Coppin’s older members, who have become their extended family — family members who feel free to offer guidance on many topics. Ms. ROLLE: Oh yeah. Everything from child rearing to fashion advice — they’ll let you know. I experimented with a different hair color a few weeks ago. “Baby, that’s not the right one!” They’re a resource of information and encouragement, especially those older women. I mean they’re some prayer warriors. LAWTON: They believe supporting the church, and being supported by it, is all part of God’s plan for the church. Ms. ROLLE: It’s God’s kingdom here on Earth. Mr. ROLLE: Right now, if I were to miss church, I’d feel I’m missing a blessing. LAWTON: The Bentles, the Van Beurens, and the Rolles are all working out their spirituality in the context of the local church. Their identities are not wrapped up in denomination or in being Protestant. 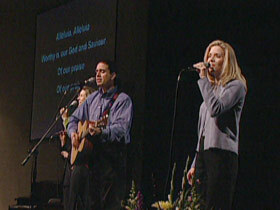 Their worship styles and their beliefs may vary, but they share a commitment to the particular congregations they’ve chosen — one of the hallmarks, experts say, of being Protestant in the U.S.A.
BOB ABERNETHY: Many of the people who study American religion say they see signs of a softening, in recent years, of commitment to traditional doctrines and beliefs, at least among the main line. Robert Wuthnow. Dr. WUTHNOW: It looks like religious beliefs just aren’t as important as they used to be. We’re more convinced that it’s practice, it’s experience, it’s having some kind of relationship with God that matters. Dr. MARTY: People are suspicious of dogma, doctrine, stipulated rules. It doesn’t mean they disagree with them. It’s just that they aren’t so moved by them. ABERNETHY: We tried to test the softening-of-beliefs theory in our poll, asking people to choose from a list their most important reasons for going to the church they attend. To our surprise, solid majorities of all streams of Protestantism — evangelical, the black churches, and the main line — said beliefs, doctrines, and creeds are most important. But for mainline Protestants, community was equally important. John Green of the University of Akron does not think theology is a top concern. 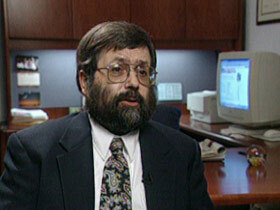 Dr. JOHN GREEN (University of Akron): Most of us end up picking our religious communities really for other reasons. Probably the dominant reason is how we were raised, you know, the particular community that we inherited from our parents. ABERNETHY: At the same time, there is a lot of seeking and experimenting. Nancy Ammerman. Dr. AMMERMAN: The average Protestant church finds within its pews that at least half of the people there did not grow up within the denomination of that church. ABERNETHY: Robert Franklin, President of the Interdenominational Theological Center in Atlanta, sees many worshippers as shoppers. 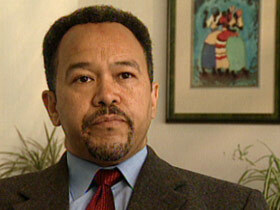 Dr. ROBERT FRANKLIN (President, Interdenominational Theological Center): We are becoming a consumer church culture. People search for in a congregation an ensemble of ingredients or factors that are user friendly. So being Lutheran or Baptist of Episcopalian may be less important to that church consumer than having a terrific youth program or a great preacher or good music. ABERNETHY: The weakening of loyalty to old denominations may help explain the dramatic rise of nondenominational churches, which now make up 19 percent of all congregations. If all the nondenominational churches were one denomination it would rank number three in the country, after Catholics and Southern Baptists. The growth of the Church of God in Christ is another sign of the importance of religious experience. COGIC, as it is known, grew out of a revival in Los Angeles in 1907. Today it has five and a half million members and is the fifth largest among all Protestant denominations. Pentecostals in general have been called “the fastest growing Christian movement in the world.” Many Americans also like to attend big worship services. About half the churchgoers worship in the biggest 10 percent of congregations. 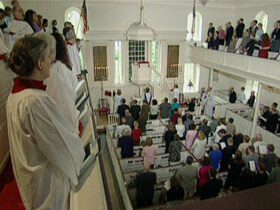 But that leaves the majority of all Protestant congregations with fewer than 100 worshippers, and the median is 75. Meanwhile, about half of all churchgoers are involved in small groups for Bible study, prayer, meditation, or self-help. In our poll, half of all Protestants say they attend religious services at least once a week, and even more say they are involved in their church beyond Sunday worship. But scholars say when it comes to figures on church attendance, beware. Robert Wuthnow. Dr. WUTHNOW: I think the poll data are probably exaggerated, maybe by a third, something like that. And I think it’s partly because people want to appear religious, maybe even more religious than they really are. ABERNETHY: But even if church attendance numbers are exaggerated, that still leaves about five million Americans going to church in any week. So as more and more Americans seek direct, personal spiritual experience, there has been strong growth among evangelicals and Pentecostals, and in new nondenominational churches. Many individual mainline churches are vibrant and strong, but the main line as a whole is no longer the national power it once was. But what an influence it and Protestant ideas have been. Protestants stood for religious freedom and democracy, the famous Protestant work ethic, and great movements for social reform. Martin Marty says they shaped America. Dr. MARTY: They helped pass its laws, they helped found it in the constitutional era, they helped give impulse to its business. You just cannot tear the two apart. ABERNETHY: On Protestant influence on the country and on all its people, of whatever religion, one observer has noted, “We are all Protestants now.” Next time, the Catholic Church in America, the experience of being Roman Catholic, and the Church’s current crisis.